When I was planning my southern garden, I knew I had to have a Camellia Walk. Many years ago, when I lived in Massachusetts, I would regularly visit the Lyman Estates. It was there that I saw my first Camellias. A visit to Mr Lyman’s greenhouses in February was an incredible sight. There were greenhouses where grapes were ripening during winter, fragrant Jasmines & Daphne. One greenhouse was devoted to Camellias and they formed a spectacular avenue. It was a southern garden in a series of greenhouses. the entrance to The Camellia Walk …AKA …The Winter Garden. Truly Southern with its swept dirt, curved path; it leads from the back of the house to the compost & (former) chicken house. Underplanted primarily with evergreen ferns & Lenten Roses (Helleborus orientalis), it never looks bare even in the dead of winter. In fact, that is when it comes to life! This entry was posted in Camellias, Garden Design, Shade Gardening and tagged Camellia walk, helleborus, Lyman Estates, shade gardening, winter garden. Bookmark the permalink. How few people understand Swept Dirt Paths are a LANDSCAPE DESIGN feature. A choice. Swept Dirt Paths are desirable, beautiful, nurturing. Have had to ‘sell’ clients the concept. I know you have too. Honey, yours are beyond fabulous. Beautiful photos. My neighbor has camellias. How are they propagated? Nice hostas and ferns along your path. Hmmm….camellias vs. -30 C. I think camellias would win. Too bad there are other factors keeping us here. The warmth and the gardens would be a big draw if it were up to me. Your garden looks so lush and beautiful. Sandra, having a winter garden would be worth moving for!! You do get soooo sick of grey (or white), long, long winters. Ah – camellias! The very essence of a Southern garden – in spite of us all struggling with heat/humidity down here in GA., we can “do” camellias – and what a treasure they are in mid winter to pick some & float in a bowl – we do get lucky here being able to have our wonderful camellias. I so agree Carolyn, The Camellias are worth every one of those hot days in summer. Its time to shine up that crystal bowl. Oh – forgot to ask – what are the evergreen ferns? Sandra, I love the look of those lovely winding paths into the trees. and of course, I’m truly jealous that you can have camellias in winter! We are getting colder here each day and soon the snow will fall. marguerite, I remember it well! Great posting just love camellias. We found our first bloom today! Just a small Camellia sinesis (tea camellia) bloom. Loved that path and the hellebores! A kindred spirit. Loved your post on Camellias too. Dear Sandra, How wonderful, a Camella Walk. And, what an inspired idea to underplant with Hellebores. Lovely! Edith dear, you are so generous with your praise, thank you so much. 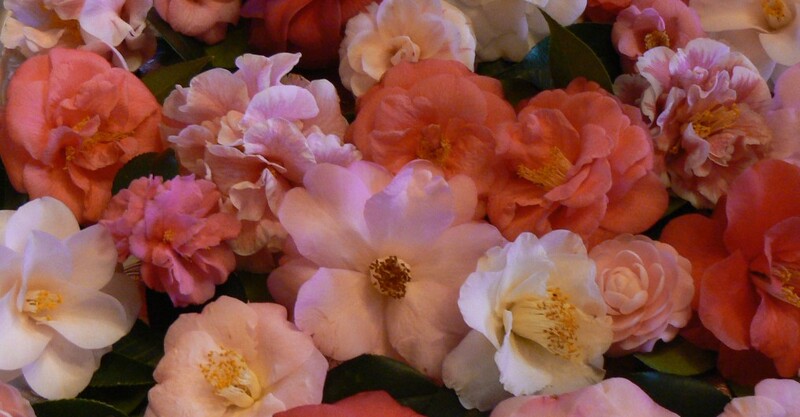 We’d love to take the camellia walk! Come on over! The peak of the sasanqua season is just around Thanksgiving.